Note, the dress is actually cream, but it "films" white. Many of these images have extra large files as well as the standard sized hyperlinked ones. Only the medium sized files are printable w/o adjustment. First of all the 'white dress' is actually a very light cream color. It is made of a fine wool blend. The neckline of the dress is not seamed at the edge- it is seamed underneath and covered with a bias tape about 2-3cm to hold the shape. Brenda and I spent quite some time trying to decide if there was actually a second piece of the wool edging the neckline, but in the end decided that it was the same as the dress. 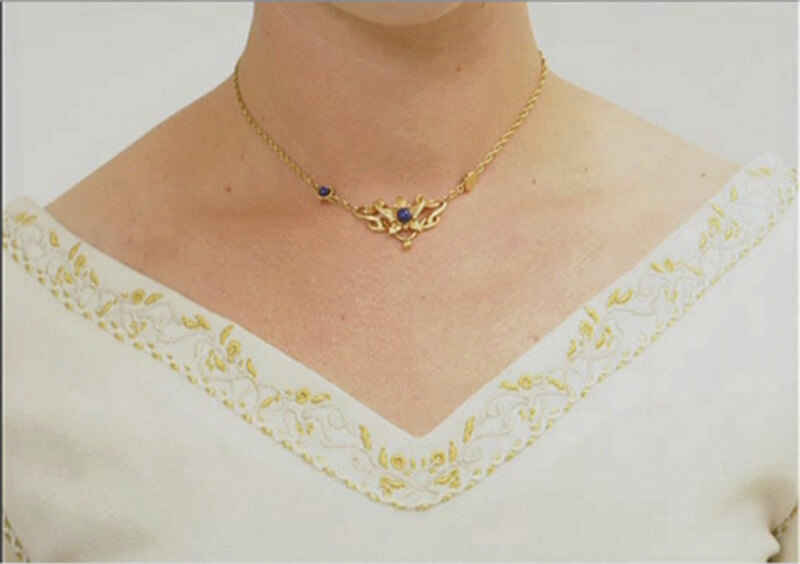 The top inch of the neckline is decorated with golden scrollwork and lined underneath with a fine (about 1/8th of an inch) trim which is a simple light cream and gold twist). This same trim lines the armholes and the sleeve edges. The decorated part of the neckline does not extend all the way around the dress. It narrows and comes to a point at the shoulders. The back neckline of the dress is simply edged with the trim. At the shoulders, there is about 2 inches of material until the sleeves begin. The sleeves are trumpet shaped and are not lined in gold. They are instead lined with a fine wool (blend) brocade the same color as the dress and then edged with that cream/gold trim. The top edge of the sleeve end is at fingertip length and the bottom hangs just below the knee. Now here is the kicker. There is a whole other sleeve under that sleeve! Brenda saw a poster on the wall that had a pic of Eowyn with gold cuffs under the sleeve, so we both raced back to the dress... and voila! there it was! It is made of a sheer cream fabric with an intricate gold design. It is lined with the same wool as the dress and is rather close fitting. Beautiful! The undersleeves are held close at the wrist with a lacing. Two pieces of trim are sewn down the under part of the sleeve about 4 inches around the wrist. These are then laced tight with small cord. On to the belt. It is done in the same color as the dress and in needlework. The part that hangs (one tail only) has two rows of thin gold trim in a weaving design down the length- You will see this in the pictures. Around her waist, the same design continues but is also covered with \discs- Brenda counted about 24 in all. The center front somewhat larger than the rest. There did not appear to be any tie like Galadriel's in the back. When I go back , I will ask one of the workers to take a peek and see how it is fastened. The dress has 2 belt loops to hold the belt. As far as the length of the dress, the front is at the top of her boots and very slightly lengthens as it goes to the sides. When the hem reaches her sides it then rather quickly drops another 8 inches or so. Kira's ROM report: Her dress is fine cream wool, the body cut in three, I think- one front piece and two back. The neckline is scooped and edged with cream and gold floral embroidery. The sleeves are tight to the elbow and then bell, and are lined with cream brocade. The armholes are edged in cream braid. There is criss-crossed cream braid on the sleeves from the upper arm down about three inches- I think it crossed four times. She wears a long girdle that probably fastens at the back. The belt part has floral metalwork rondels maybe an inch wide, and the hanging part of the girdle is embroidered with gold thread. I think the girdle fabric is canvas. 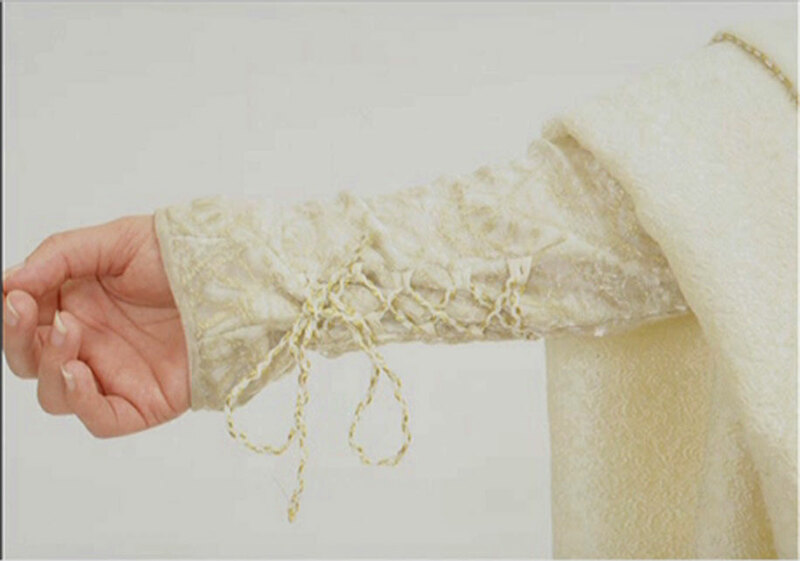 Nienna's ROM notes: A thin gold and white braid runs along the seam where the sleeve meets the bodice of the dress (like piping). It's maybe 1/4"-3/8" wide. I couldn't tell if it was flat like braid, round like piping, or somewhere in between. The same trim is also along the sleeve edge where the sleeve meets the lining. Don't know if it's been mentioned, but the sleeve lining is brocade fabric (looks like wool). The embroidery is just in the front. The band is about 1 1/2 inches wide. There are 3 repeats of the design on each side. They meet in the center with a bit more design. From the 16 month calendar for TTT. We do not have an extreme close-up but here is a suggestion on how the stitches could be done until we see the original nose to nose and get a final description. Thanks to Shannon for the sample. Finished example from Shannon, NOT THE REAL DRESS. See her costume write detail in the Scrapbook. Kira = She wears a long girdle that probably fastens at the back. The belt part has floral metalwork rondels maybe an inch wide, and the hanging part of the girdle is embroidered with gold thread. I think the girdle fabric is canvas. She wears a flat white boot. It is front lace and rises to mid-calf. Some detailing on the fine necklace she's wearing. Back shot, blowing in the wind, tower in background, for your consideration add. long shot, textured but sleeve shape looks good. Can see the lacing details as well as the mini bugles that edge the sleeve. 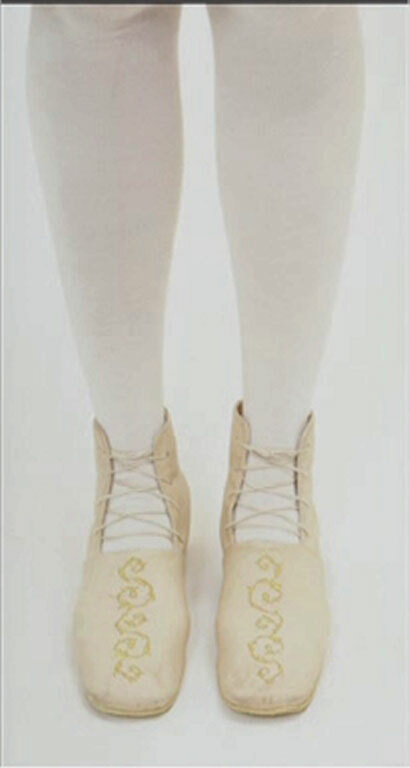 There is an Eowyn action figure, 10" doll, in a white gown similar to the one described above. The gold belt with long 'tail' in front is seen and the ties above the elbows look to be the same gold color. Her sleeves are edged in trim or embroidery. The waist of the belt shows round silver detailing – could it be embroidered on? can see the belt, but it is indistinct. If we had the box, could probably answer the questions about the belt - beads or metal. ?